-The flavor is incredible, they taste sausage-y, thanks to a sprinkling of fennel seeds and a heavy hand with the herbs. -There’s spinach hiding in them! Even though they’re warm and comforting, they’re on the more nutritious end of the spectrum when it comes to freezer foods. -They’re great as a Passover dish or a non-Passover dish. They’re not like those foods that only really taste good on the sixth day of Passover when you have Passover goggles on. -Eggboy is obsessed with meatballs. He is meatball boy. -They freeze and reheat really easily. I store them in a ziploc bag, so they can smoosh in anywhere in the freezer, and then you can reheat them just by tossing them into red sauce or sticking them in the oven. Here I’ve plated them up with some creamy tahini sauce (garlicky yogurt sauce is also nice) and a super bright and springy chimichurri. It’s a fun way to eat them for a pasta-less week or if you’re just looking for a filling side for an otherwise vegetable-centric meal. When it’s not Passover I’m definitely piling these high on top of pappardelle. Heat 2 tablespoons olive oil over medium heat in a large oven-safe skillet. Add the onion and a pinch of salt and cook until soft, 5-7 minutes. Add the garlic and fennel and cook for another minute and then add the spinach in batches, stirring, until wilted. Remove from heat and let cool slightly. Meanwhile, in a large bowl, combine the egg, breadcrumbs, 1 teaspoon salt, a few turns of black pepper, the onion powder, cayenne, thyme, oregano, paprika, parsley, turkey, and the slightly cooled spinach mixture and use your hands to mix to combine. Wipe out the skillet that was used to heat the spinach and then heat a thin layer of olive oil over medium high heat. Form the turkey mixture into golfball-sized balls and brown them on all sides, in 2 or 3 batches, being careful not to crowd the pan. Transfer the browned meatballs to a plate. Once all of the meatballs are browned, return them to the skillet and stick the skillet in the oven for 7-10 minutes, until they’re cooked through and have an internal temperature of 160ºf. To make the tahini sauce, whisk together the tahini, lemon juice, and water until smooth and pourable. If it’s too thick, add a bit more water, if it’s runny, add more tahini. Season with salt and pepper. To make the chimichurri, combine all ingredients in a food processor, seasoning with salt and pepper to taste, and blend until smooth. If you don’t want to use a food processor, you can also chop the herbs and garlic finely by hand and mix with the lemon juice, olive oil, salt, and pepper in a bowl. 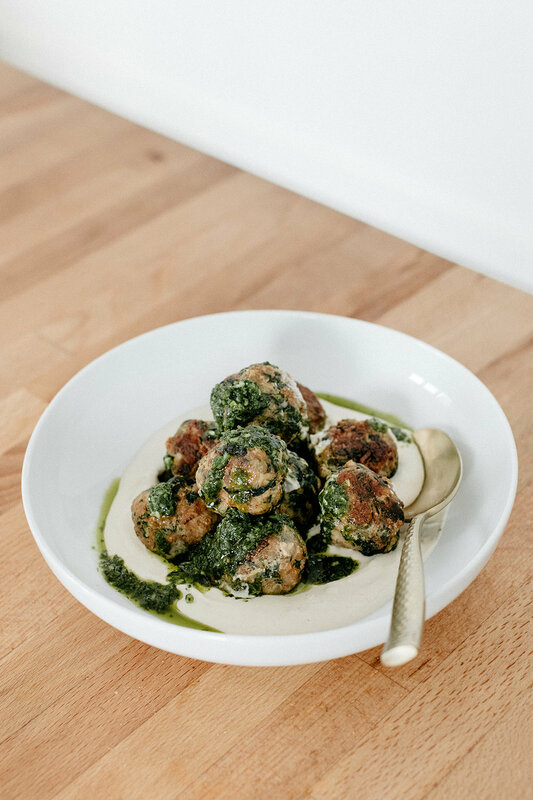 To serve, spread a large dollop of tahini sauce on a plate or shallow bowl, top with meatballs and drizzle on the chimichurri to taste. Enjoy! To freeze: cooked meatballs can be cooled and stored in a ziploc bag in the freezer for up to 3 months. To reheat, place on a sheet pan and cover with foil. Bake at 350º for about 15-20 minutes, or until heated through. Prepared chimichurri can be frozen as well. Defrost at room temp or heat briefly in the microwave. I wouldn’t recommend freezing tahini sauce, but it’s super easy to whip up! spring, recipe, poppy seed, "passover", "meat"